Broccoli is a very healthy vegetable which helps to reduce cholesterol,maintains low blood sugar level,good for bone health and prevents cancer too with its powerful antioxidants.Last month when i went to Total mall i picked broccoli,wheat grass,baby tomatoes and some more vegetables which are rarely found in shops nearby my house.I tried broccoli stir fry for the first time following my mom’s South Indian style cauliflower fry recipe and loved it a lot.Its a very easy stir fry recipe to prepare in busy morning hours.U can make it without onion & garlic too.I packed the same for Sendhil’s lunch box along with thogayal rice and curd rice.He too liked it.We were very happy to include this healthy vegetable in our regular lunch menu and i am planning to try and share more broccoli recipes in my food book.Ok,Lets see how to make this easy,Indian style,Vegetarian broccoli stir fry recipe at home . 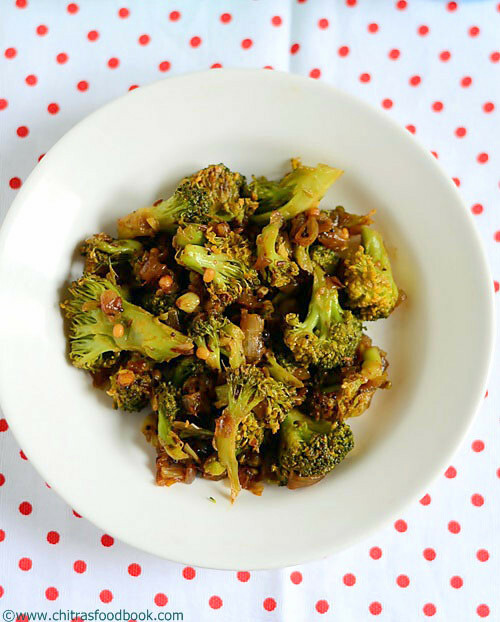 Broccoli stir fry - Easy,healthy stir fry recipe that can be made in minutes ! Remove the florets from broccoli,wash and soak in water till use. In a wide kadai,temper the ingredients given above in the same order.Then add finely chopped onions,garlic cloves & ginger pieces. Saute till onion turns transparent.Add the required salt while sauting. Now add the soaked broccoli florets and saute well for a minute in medium flame.Add the sambar powder and mix well.Sprinkle some water,mix well and cover cook in medium flame for 5 minutes.Toss it once or twice in the middle.Make sure nothing is burnt. After the broccoli is cooked without losing its shape,switch off the flame.Add lemon juice,mix well.Garnish with coriander leaves,remove and serve ! Enjoy with sambar rice or Rasam rice ! Tastes yummy ! For no onion,no garlic version,simply skip onion and garlic and try the same.It tastes good in either ways. U can cook broccoli in water for few minutes before sauting as we do for cauliflower.Its optional though. U can replace sambar powder with 1/2 tsp of dhania & red chilli powder each. 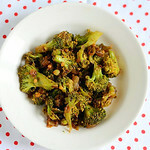 Serve this healthy,yummy stir fry with sambar rice or rasam rice.Tastes gr8 ! I don't like broccoli,pics r very tempting. 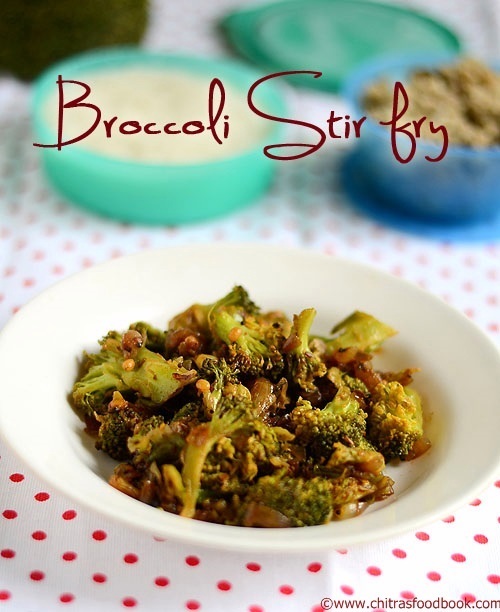 Love the broccoli ...Yummy fry ..
very healthy and yumm.. Super chitra..